The United States Congress designated the Alexander Springs Wilderness (map) in 1984 and it now has a total of 7,327 acres. All of this wilderness is located in Florida and is managed by the Forest Service. The Alexander Springs Wilderness is bordered by the Lake Woodruff Wilderness to the north and east. The 7,941-acre Alexander Springs Wilderness is one of four designated Wildernesses in the Ocala National Forest of central Florida. To the north and southeast, it borders the Lake Woodruff Wilderness. Like the others, the Alexander Springs Wilderness, established in 1984, is managed by the U.S. Forest Service. Terrain The Wilderness is named for Alexander Springs Creek, which meanders through its swampy heart toward a confluence with the St. Johns River. (The eponymous first-magnitude springs that give rise to the creek actually lie several miles away on the edge of the Billies Bay Wilderness.) The St. Johns defines the northern and eastern boundaries of the Wilderness. Though waterlogged bottomland dominates the Wilderness, some higher ground does exist, including the scrub uplands in the west, Kimball Island in the northeast, and scattered Indian shell mounds. Landmarks include Stagger Mud, Kimball, Lee, and Horseshoe Mud lakes; a cluster of ponds in the western uplands; and the sluggish courses of Stagger and Get Out creeks. Ecology Much of the Alexander Springs Wilderness is dominated by hardwood swamp forest interspersed with hammocks of cabbage palm and live oak. The western and southern reaches include tracts of sand-pine scrub, an imperiled ecosystem that finds its greatest refuge in the Ocala National Forest. 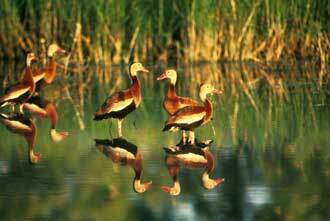 A rich array of wildlife utilizes the river, wetland, and forest mosaic. Keep an eye out for alligators, white-tailed deer, red-shouldered hawks, and a plethora of wading birds. Notes The easiest way to explore the Alexander Springs Wilderness is by boat: No trails or old tracks exist for easy foot access. Alexander Springs Creek provides an excellent venue for paddling; be aware that you may encounter motorboats on the creek, allowed by the Florida Wilderness Act of 1984. You can rent canoes at Alexander Springs Recreation Area and paddle downstream into the Wilderness. No haulback service is offered, which means you must make an upstream return paddle or otherwise shuttle your canoe back to the Recreation Area. Planning to Visit the Alexander Springs Wilderness? How to follow the seven standard Leave No Trace principles differs in different parts of the country (desert vs. Rocky Mountains). Click on any of the principles listed below to learn more about how they apply in the Alexander Springs Wilderness.